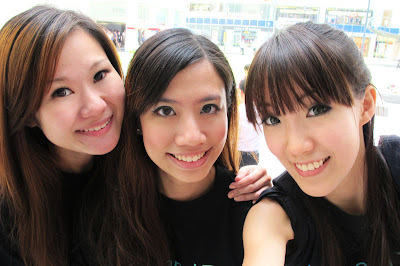 Confession of a Die-Hard Makeup Junkie ❤: Yuki's SingTel & BlackBerry Event at Raffles Place! Yuki's SingTel & BlackBerry Event at Raffles Place! 28.09.2011 - Did a SingTel & BlackBerry event with my MBS Sweetheart Cherleen and Alison babe! :) It was really a fun & simple job - just distribute STICKY sweets & BB brochures to the crowd at Raffles Place! Conclusion: NEVER under-estimate the snatching power of Uncles & Aunties over there! O.O"
=) The Three Musketeers after work.Alison was complaining she look short (actually she's not!) between us. :P No choice babe, me and Cher were wearing KILLER heels! LOL! After which, me and Cher babe went down for casting but I could not make it due to some personal issues... =) GOOD LUCK BABE!! !